Sandy damaged or destroyed 305,000 housing units in New York and more than 346,000 in New Jersey. Three months after Sandy ravaged coastal areas in much of the Northeast, Congress on Monday sent a $50.5 billion emergency relief measure for storm victims to President Barack Obama for his signature. For more U.S. news, visit NBCNews.com. "This is a huge relief," said Sen. Charles Schumer, D-N.Y., noting the vote came 91 days after Sandy struck. "We are now just a presidential pen-stroke away from beginning the rebuilding process in earnest." Lawmakers say the money is urgently needed to start rebuilding homes, businesses, public transportation facilities and other infrastructure damaged by the Oct. 29 storm, one of the worst to strike the Northeast. Sandy is blamed for more than 130 deaths in the U.S. and tens of billions of dollars in property damages, particularly in New York and New Jersey. The House passed the bill two weeks ago. The measure is aimed primarily at helping residents and businesses as well as state and local governments rebuild from the storm. Sandy roared up the East Coast and has been blamed for more than 130 deaths and billions of dollars in residential and business property damage. The biggest chunk of money is $16 billion for Housing and Urban Development Department community development block grants. Of that, about $12.1 billion will be shared among Sandy victims as well as those from other federally declared disasters in 2011-2013. The remaining $3.9 billion is solely for Sandy-related projects. More than $11 billion will go to the Federal Emergency Management Agency's disaster relief aid fund for shelter, restoring power and other storm-interrupted utility services and meeting other immediate needs arising from Sandy and other disasters. Another $10 billion is devoted to repairing New York and New Jersey transit systems and making them more resistant to future storms. "The funding in this bill is urgently needed," said Sen. Barbara Mikulski, D-Md. "Hundreds of thousands of families have seen their lives turned upside down." Obama Tours Sandy Damage, Tells NYC "You're Tough"
Sen. Dan Coats, R-Ind., said Republicans weren't seeking "to undermine" help for Sandy victims but instead were trying to make sure that the money was actually being spent on emergency needs. "We're simply trying to say we need some standards," Coats said. Earlier in January, Congress approved and Obama signed a $9.7 billion bill to replenish the National Flood Insurance Program, which has received well over 100,000 flood insurance claims from businesses, homeowners and renters related to Sandy. Added to the new, $50.5 billion package, the total is roughly in line with the $60.4 billion that Obama requested in December. Sandy damaged or destroyed 305,000 housing units in New York and more than 265,000 businesses were disrupted there, according to officials. 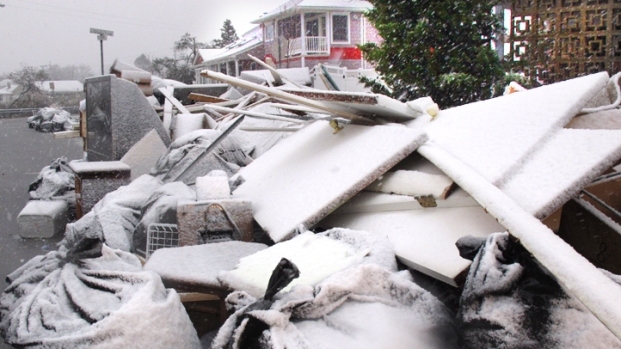 In New Jersey, more than 346,000 households were destroyed or damaged. The aid package was greased for passage before the last Congress adjourned and the new one came in on Jan. 3. But Speaker John Boehner refused to bring it to the floor after two-thirds of House Republicans voted against a "fiscal cliff" deficit-reduction deal raising taxes on couples making more than $450,000 a year while deferring some $24 billion in spending cuts to have been shared between defense and domestic programs. The ruckus after the Senate had passed an earlier $60.4 billion Sandy relief package by a nearly 2-to-1 margin on Dec. 28 exposed deep political divisions within Republican ranks. "There's only one group to blame for the continued suffering of these innocent victims, the House majority and their speaker, John Boehner," Republican New Jersey Gov. Chris Christie fumed at the time. GOP leaders cut spending in the Senate bill unrelated to disasters. One was to transfer $1 billion for training Iraqi policemen to instead be used on bolstering security at U.S. diplomatic missions. The shift in money followed a Sept. 11 terrorist attack on the American consulate in Benghazi, Libya, where the U.S. ambassador and three other Americans were killed. Also deleted was $188 million for an Amtrak expansion project that included new, long-planned tunnels from New Jersey to Penn Station in Manhattan, and another $150 million for fisheries disasters that states such as Alaska and Mississippi could have shared. After all the cost-cutting, 179 House Republicans still voted against the disaster aid package with only 49 favoring it. GOP leaders had to rely on yes votes from 192 Democrats to pass it. The Senate on Monday rejected, 35-62, an attempt by Sen. Mike Lee, R-Utah, to amend the final package Monday with a provision to cut federal programs across the board by one-half of 1 percent through 2021 as a way to prevent the disaster aid from swelling the U.S. debt. While the bill passed by the Senate carries a $50.5 billion price tag, it could trim 5 percent or so if across-the-board spending cuts are allowed to take place on March 1 as scheduled under current law. The cuts, known as a sequester, are punishment for the failure of a congressional deficit "supercommittee" to follow up a 2011 budget pact with additional deficit curbs. The cuts would apply equally to every account in the measure. As of Monday, FEMA said it spent $3.3 billion in disaster relief money for shelter, restoring power and other immediate needs arising from the storm. New York, New Jersey, Connecticut, West Virginia, Virginia, Maryland, New Hampshire, Ohio, Delaware, Rhode Island, Pennsylvania, Massachusetts and the District of Columbia have shared that money.